I took a long reflective pause when I heard George H.W. Bush passed away at 94-years old. Memories of his controversial pardons for six members of his administration facing prosecution in the Iran-Contra investigation haunted me. When I was growing I was taught to never speak badly of the dead. It was wrong. Period. I thought about Trump's use of pardons. But (with emphasis), there are no other comparisons between the two presidents. * You can't compare a draft dodger with a WWII combat bomber pilot. * You cannot compare the difference between Bush's essential authenticity and Trump's phoniness. * You cannot compare Bush's "...thousand points of light" to Trump's America First. * Bush always sought to set the bar higher, while Trump lowered the bar, violating the Constitution, attacking America's intelligence community, and attacking our judicial system right up to the Supreme Court. 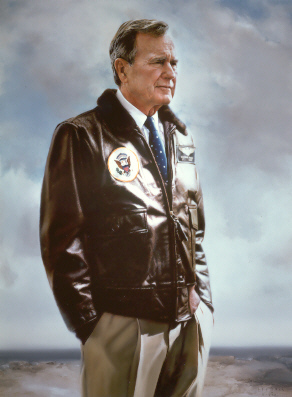 The nation, and the world, is honoring the passing of our 41st president, George H.W.Bush. Praise for his accomplishments continue to pour in. Rest in peace, Herbert Walker Bush. You are the end of an era.